In this photo the carabiner is radically tri-loaded. An impact on such a carabiner could cause failure. 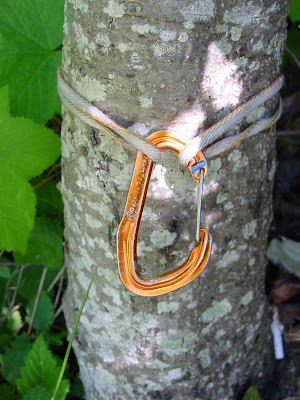 A tri-loaded carabiner is crossloaded. It will not hold a high impact fall. As such, it is important to use slings that are long enough to tie off. 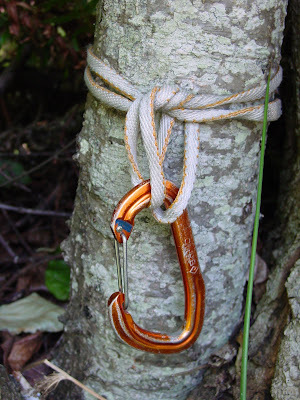 In the preceding example, there is not enough sling material to get all the way around the tree, but even if there was enough for the carabiner to hang more loosely, it could still triaxally load it. One could tie the sling off with a pre-equalized knot, but this isn't required. The following photo shows one quick example of a tie-off that eliminates the possibility of triaxal loading. Triaxal loading is a detail that a lot of climbers don't think about. But it is just these kinds of minor details that can get you in the end. The phrase, "the Devil's in the details," didn't come from nowhere. Easy, simple, effective and safe. So many try to overly complicate such things...good post - thanks!